Visitors to the magnificent Jefferson building of the Library of Congress in Washington, D.C. can ascend her rococo double stairway, turn to the left past the opulent green wallpapered reading gallery, and into an exhibit hall filled with Mesoamerican urns, acid etched copper Renaissance globes, and framed coffee-colored maps which line a serene and almost melancholically dark room. On one wall, at the very back of this room, encased in a climate-controlled chamber filled with argon gas, is an impressively large, brittle and browning map of the world from 1507, printed in Alsace-Lorraine by the formidable and respected German mapmaker Martin Waldseemüller and his friend, the poet Mathias Ringman. Committed humanists, the men who produced the map were cartographers who heard stories of the new discoveries being made by sailors and merchants for the Spanish and Portuguese. 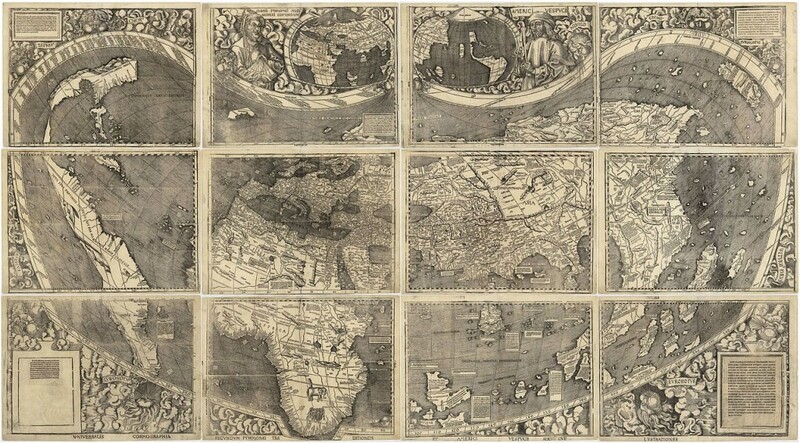 Across twelve separate panels, the map depicts a huge heart-shaped cartouche in which the entire geographic knowledge of the world up until the early sixteenth-century could be presented in an expression of completest ardor, a new Universalis Cosmographia. The accuracy of the map is superior to the so-called medieval T-O maps (named as such for envisioning the world as effectively a perfect letter T enscribed within an equivalently perfect circle), for unlike those maps charted in the mathematics of myth, Waldseemüller and Ringman attempted to draft a diagram according to the particulars of fact. Their universal map was the most accurate of the era, but to a modern audience, the Universalis Cosmographia is shockingly erroneous. Out of a thousand printed, the map in the Jefferson Building is the only copy which survives; five gores (a type of map cut in a way so as to be attached to a round wooden globe) and this original are all that remain of the earliest usage of the word “America.” Those of a romantic bent have referred to the Waldseemüller map as a “birth certificate” for the continents, although strictly speaking North America had yet to be officially discovered, and the northern ribbon of land the German drew was a hypothetical terra Incognita. That’s certainly the language used by the Library of Congress when in 2003 it completed negotiations with German Prince Waldburg-Wolfegg to purchase the Waldseemüller for $10 million dollars; the document was discovered by a Jesuit cartographer in the early Twentieth Century, having survived four centuries as a complete portfolio in the Prince’s ancestral castle in Upper Swabia. Money was exchanged, speeches were given, Angela Merkel came to a ceremony. Despite the fact that later editions of the Waldseemüller map deleted the word “America,” the decision to name the new continents after the Italian Amerigo Vespucci endured, even as some preferred the name “Columbia,” which had an antique ring to it even then. Vespucci had the rare and singular honor to be the only person in history to have such a large portion of the world christened in his honor while he was still alive. “Europe” of course named for a mythic Phoenician princess, “Africa” from a Latin name for a Libyan tribe, and “Asia” a name so ancient that not even Herodotus knew its etymology for certain. But this new word “America”, is as mystical sounding as those that designate the three parts of that previous world found its provenance in the Christian name of an Italian from Florence. As Ringman wrote, “There is a fourth quarter of the world … we can call ‘America’ or the land of Americus …We do not see why the name of the man of genius, Amerigo, who has discovered them, should not be given to these lands, as Europe and Asia have adopted the names of women.” Vespucci lived for six more years after his name was given to that fourth part of the globe, dying a year after that stout Balboa with eagle eyes that first stared at the Pacific, even though Waldseemüller had logically predicted that ocean’s eventual discovery and placed it on the map. This new world upset the Trinitarian balance of those continents of old, where Shem, Ham, and Japeth had once descended, dwelled and multiplied. Here now, was a new continent which did not fit into the schema of tradition, and the name on it was Amerigo’s. Envision what it was like to be this man who had knowledge of this brave new world with such people in it, and envision being Waldseemüller and Ringman having the strange authority to baptise this place. The name of the country is not the only one which has a certain power of conjuring transcendent evocations. Certainly, “Britain” with its Arthurian connotations can sound similarly mythic. Counterintuitively, Britain is in many ways even more of a constructed identity, first born out of Tudor propaganda calling back to the Celtic past of the ancient Britons, which James I attempted to impose as an identity on the diverse kingdoms of England, Wales, and Scotland, and not legally made the name of those nations until a century later. This was a national myth of political expediency, when Scotland was wed to England following the former’s inglorious economic degradations in Panama requiring a union whose sutures may yet be removed. But as mystical as the green and pleasant lands of Britain may be, “America” as a word seems to be used even more commonly as a type of incantation, as witnessed by how frequently it appears as an adjective modifying a noun in the title of a work of literature, film, or music. The word “American” is meant to convey a certain power, grandeur, or seriousness. We’re in the realm of the Great American Novel, epic narratives heralding the endlessly mercurial, tough paradise that the country is supposed to be – or on the contrary, the word “American” serves to demonstrate reality’s ironic distance from those things promised in the title, as an act of blaspheming jeremiad. To wit, the following terms have had the word “American” placed in front of them in the titles of films of varying degrees of critical and commercial acclaim: Beauty, Gangster, Pie, Graffiti, Hustle, Psycho, Buffalo, Haunting, Rhapsody, Summer, Terror, Fetish, Gigolo, Pop, President, Virgin, and Splendour. There is something more charged about the word “American,” for who has seen Belgian Psycho or Canadian Beauty? As a word “America” is both dangerous and consoling in its promises – false and otherwise. Rarely does a single word seem to have such implicit potential drama, a latent atomic energy contained in such a tiny nucleus, an unexploded gun always waiting to be discharged. Of course nativists have not always thrilled to the fact that “America” is an Italian name which ends in a vowel, and so alternative explanations of the name’s origins have periodically arisen. In the early Twentieth Century one historian claimed that “America” took its name not from Vespucci, but rather from a certain Bristol merchant, trader, and sheriff named Richard Amerike who owned the Matthew upon which John Cabot sailed. According to Bristol resident Alfred Fudd the name “Amerike” was well known in the port at the turn of the sixteenth-century, and Waldseemüller and Ringman simply made a transcription error on their map by assuming that the name “America” must come from Vespucci and not from the solidly Anglo-Saxon Amerike. English-enthusiasts of this theory must overlook the fact that he who gave America an English name wasn’t originally John Cabot but was rather Giovanni Caboto. A few decades after Fudd’s conjecture, a Scandinavian historian claimed that the Norse word for district, “Amt,” was added to Erik the Red’s name to produce “Amterik,” or “America.” Etymologists of an equivalently Nordic supremacist character have claimed that the name really comes from the Norse “Ommerike,” which translates as “farthest outland.” There are other (almost certainly untrue) assertions that the name of the continents can be originally derived from the Anglo-Saxon kingdom, Mercia. Fanciful etymologies are not limited to northern European attempts to usurp the swarthy Vespucci from his position of pride, there are also examples of claimants that “America” as a word is, American in origin. These theories elevate not nativists but natives, seeing the name of the country as having a solidly domestic origin. One French scholar in the nineteenth century claimed that Vespucci actually changed his name from “Alberto” to “Amerigo” so that it would more closely match the name of the Amerique tribe of Nicaragua, who would thus be the true originators of their own continents’ name. Others have claimed that the name has its origins among the languages of the Carib, Mayan, or Algonquin Indians. While such claims are often grounded in little more evidence than that which posits Richard Amerike as he who granted his name to the baptism of the nation, there is some evocative and compelling indications that such stories could possibly have a bit of the truth about them. The question of the origin of the name itself enacts one of the central tensions of who gets to be called an American. After all, the word could be applied to any of thirty-five nations in the Western Hemisphere, where the overwhelmingly most popular language is not English, but Spanish. Indeed of the five largest cities in the Americas, only New York City (which is the third largest) is primarily English speaking, while also having an English name. It was of course founded by the Dutch. Over a billion people live in North and South America, dwarfing the slightly over three hundred million who live in the United States, making palpable the general annoyance directed at that minority who feel entitled to the exclusive rights of the designation “American.” I have heard it only slightly jokingly said that a more apt designation for the citizens of that land which runs from the Atlantic to the Pacific, and from the Gulf to the Canadian border should be “United Statesian,” but that of course gives short shrift to the inhabitants of Estados Unidos Mexicanos. As jingoistic and obnoxious as it might be that inhabitants of the United States claim a monopoly on the term “American” – as if Canadians, Mexicans, Hondurans, Brazilians, Guatemalans, Argentinians, Chileans, Uruguayans, Bolivians, Nicaraguans and so on aren’t really in the Americas – there is some historical justification for their claimant. The word “American” may have originally come from Vespucci’s baptism, but as a term applied to a group of people it was almost exclusively used to differentiate the Indian inhabitants of the continents during the colonial era. Spanish, French, Dutch, and even English colonists in what would be the southern United States never referred to themselves as “American,” but rather only thought of themselves as Spanish, French, Dutch, and English. “American” and “Indian” were synonyms, it was unthinkable that the term “American” could ever be used for a person of European descent, even if they had never been anywhere other than America. This started to change at a very particular point in time – the late seventeenth century; and in a very particular place – New England. Following the degradations of Stuart Restoration after the fall of the godly Puritan Commonwealth in England, and the royal abandonment of the colonists during the unspeakable violence of King Philip’s War, writers began to appropriate the term “American” for themselves. In the late seventeenth century the Puritan divine Cotton Mather seemed to prefigure other advocates for Americanness when he wrote in a sermon that “I that am an American,” a self-declaration which would be impossible to envision a Spaniard, Frenchman, Dutchman, or even a Cavalier planter of the Southern colonies as making during the same time period. Ultimately the Confederate descendants of that Cavalier planter were so uncomfortable with the adjective “American” that in negotiations with potential French and British allies they took pains to differentiate themselves from an American identity that they identified as a symptom of Puritan heresy, preferring rather to see themselves as colonial representatives of European civilization on the American continent, rather than as Americans themselves. I argue that the word “America” often functions as what the literary critic Stanley Fish has called a “self-consuming artifact.” Fish was writing of the Renaissance verse of English poets like George Herbert, John Bunyan, and John Milton, but what is the word “America” other than its own minimalist Renaissance sound-poem? In his analysis of seventeenth-century poetry, Fish argues that the most profound of devotional verse from the most profound of devotional centuries is often structured around a process of self-consuming. That is to say that the poems allude to something beyond language, and even in their technical acumen they point to something transcendent of words, and that as part of their design they fail in their task of trying to correspond to this reality. The language of the poems unravels, they are unable to encapsulate or express the divine experience, which was their task. But in doing so, they function as profound theological expressions of the very ineffability of language which is their medium. The self-consuming artifact is a genre of negation, a method of paradox, but so too then is “America,” which has come to mean everything from the City on a Hill to Moloch’s Babylon. As a word it can refer to a particular time and place (though as we’ve seen a wide variety of particular times and places), legally binding as a definite location but also as a quasi-mythical realm, and it can function as the grammatical intensifier of “America!” That process of the name being shouted out as mere orgasmic intensifier is what lends itself to being utilised in hawking beer under the brand name “America”, to the charlatan’s call to “Make America Great Again.” Used cynically, the word “America” is conceptualised not as that undiscovered country yet to be born on maps yet printed, but rather it is to employ the word as simple superstitious talisman. They take the Lord’s name in vain. Orthodox Jews write the name of “G-d” with a dash of negation, a type of apophatic punctuation that acknowledges that the written Lord is never the real Lord. The stipulation on taking great care in writing the Hebrew letters of the Tetragrammaton was in part so that the pious were careful not to see mere crafting of ink and manuscript as replacement for ultimate reality. Without suggesting that “America” is an equivalently mystical word, I do wish to propose that it’s a term which endlessly defers and gestures towards something much greater than and beyond itself. “The United States” may be a country bound in history and time, and by space and geography, like all countries which exist before it and which will exist after it. That “America” is in her title is a function of historical contingency, but we should be careful not to reduce that particularly mythic place to simply the nation which most prominently displays her in her title. Do not misread this as pedantic argument that the word “America” also encompasses a variety of other places, for as true as that may be, it is not the focus of what I claim here. Rather it is that the word “America” may be decoration or adornment for the names of various historical polities, but the actual location of a place called “America” is in a Republic not of this world. There is the semantic meaning of the word, and then true to a four-fold hermeneutic there is an anagogic meaning of the word. “America” may have first been printed on Waldseemüller and Ringman’s map, but its truest location in an atlas not available in our reality, for “America” is a place as mythic as the previously mentioned Eden or Utopia. But though she may not truly exist, this understanding of a New World that is full of equality, liberty and freedom is an Arcadian belief which not only can, but must structure our own yearnings towards a more perfect union. This America is not on any map, and yet necessity requires us to set our course towards her and sail in that direction regardless. America may not be real, but we must always be in the process of discovering, and more importantly creating her. The sixteenth-century humanist polymath and martyr Thomas More’s neologism “Utopia” literally translates to “No Place,” and yet the author had a detailed and concrete conception of the invented kingdom which bore that name.